Woo hoo! It’s the blog’s one year anniversary today and what better way to celebrate than a giveaway? 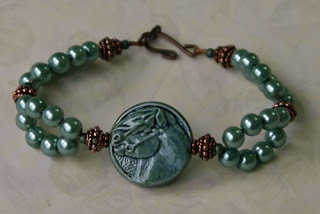 This time it’s a bracelet with a small blue-green Celtic Pony bead, glass pearls and seed beads and antique copper findings. 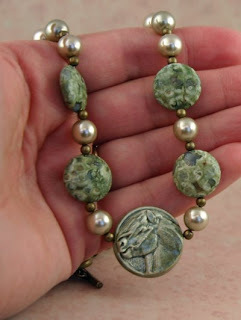 Certainly making jewelry with the small Celtic Pony beads has been far more fun. 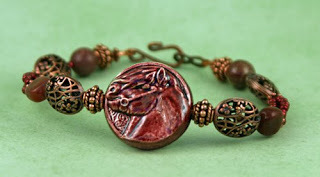 Less common metals like antique brass (above) and copper (below) are popular right now, and they have an earthly look that I really like when it is paired with the ceramic glaze. I’ve also been working on shrinking the new plaque. 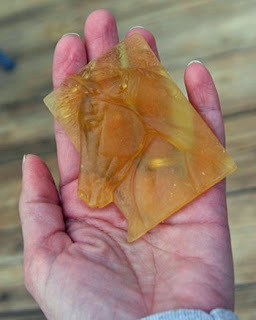 The original is around 5″ high, and this piece here (one of the rubber mold inserts) is a little less than half of that. My goal is to eventually get it down to pendant size, which should be around 1.5″ high.